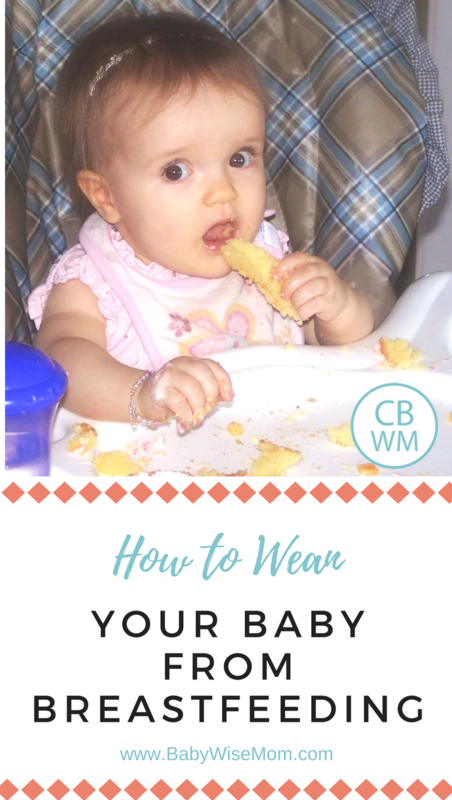 Inside: How to wean a baby from breastfeeding. Week by week process for gentle weaning. I just finished weaning Kaitlyn from nursing. With Brayden, I was completely thrilled to wean him since nursing was such a battle to get him to eat rather than look around the room constantly. With Kaitlyn, however, I was sad. She was such a good nurser. Alas, I had to wean her when I did because my husband and I are going on vacation without our kids. Yes, there are good things about nursing. I will have more freedom. When my husband and I want to go out to dinner, we can leave before her final nursing or be out past her final nursing. When she sleeps over at Grandma’s house, she can have her milk as soon as she gets up and I won’t have to be there at 7:30 AM sharp. If we are running errands, she can have her milk on the go instead of us stopping or coming home to nurse her. Yesterday we went to the park for lunch. I got her up and we just left–I didn’t have to nurse her first. I say these things just to make myself feel better :). Kaitlyn weaned very easily. Here is a rundown of how we did it. WEEK ONE: I dropped the 3rd nursing (happens at 3:30). Since she was not quite 12 months yet, she had formula instead. The first day, I fed her a 4 ounce bottle, then followed it up with nursing. I knew she wouldn’t nurse as much as usual and I wasn’t sure if she needed more than 4 ounces. I also knew this would take some of the edge off so I could more gradually decrease my milk supply. This week I was the most engorged. It pretty much took a full 7 days to get comfortable. It wasn’t as bad as when milk comes in, but not comfortable. WEEK TWO: I waited a couple of days past me getting comfortable (from engorgement). Then I dropped the lunch time nursing (happens at 11:30). She continued to not mind in the least. In fact, after a few days of this she started to sign “milk” to me (which around here means milk in a cup, not in mommy) when it was time to nurse. We got through that, though, and she continued to nurse just fine. This week only took me about 3-4 days to physically get completely comfortable in regard to engorgement. WEEK THREE: I dropped the evening nursing. I debated over which of the two to nurse. There are pros and cons to both. If you nurse at night, you can be more drained for sleeping. If you nurse in the morning, you can be more drained for your daily activities. Also, I have more milk in the morning than the evening. What decided it for me was that on Tuesday (the day I dropped it), I was cleaning the highway with the youth starting at 6 PM and she usually nurses at 7. I knew I would be home after her bedtime. So I dropped that nursing. This week only took me about 3 days to physically get completely comfortable in regard to engorgement. This feeding was probably the easiest for my body to drop as far as engorgement. WEEK FOUR: I dropped the final nursing. It has only been a couple of days–I dropped it last Sunday and today is Tuesday. I am slightly uncomfortable; I assume it will take a day or two more to get more comfortable. Last night I could sleep on my belly for the first half of the night for the first time in a year and a half! For a tummy sleeper, this is exciting. Another perk to weaning. I haven’t leaked milk at all during the weaning process. Next Post Should you wake up a sleeping child? I saw that you seemed to have a very similar feeding schedule as I currently have with my 10 month old. My daughter, too, nurses at 3:30pm and this is the first nursing I would like to try to drop. My question is, did you offer formula or milk at this time? And then did you offer “dinner” later? I guess what I’m trying to figure out is what do I do between 3:30 and bed. Would it be overfeading if I gave either whole milk or formula (I still haven’t decided what I’m going to do) at 3:30 and then regular food for dinner around 5:30-6 and then nurse again before bed at 8? Or should her milk be given when she’s eating regular food? I hope this makes sense! Thanks so much for your help; I don’t know why this seems to be so confusing for me! Stephanie, I offered formula but only because she was not quite a year old yet. My pediatrition said it was just better to wait until she was actually 12 months old before starting the milk. As soon as she was 12 months, I did milk.I think at first I did the formula at 3:30, then her dinner at her normal time before bed, BUT she was also sitting at the dinner table with us at dinner time (typically 5:30ish) and would have some finger foods with us. Soon after she was a year old, we did the milk at 3:30, dinner with the family, and more milk just before bed. Over the next couple of months, she just had milk with dinner and none at 3:30 or just before bed.Brayden, however, had that last top off of milk until he was 18-19 months old. He didn’t drink as much milk at one time as Kaitlyn does. She can get her daily milk in three feedings, while he needed four. Jake’s space,I see you deleted your comment. Please let me know if you still need help. I’m looking into starting the weaning process now as we have many evening events coming up in February. My 10.5 month old has never had formula and drinks from a sippy cup. What kind/brand of formula did you use? Should I give it to her in a sippy? I don’t want to revert back to a bottle. Thanks for your help! Matt and Brooke, we have used the Walgreens store brand formula. It is less expensive than the brands and worked great. I tried Costo/Kirkland brand which is even cheaper and hated it. It would foam up when you mixed it up and then foam would never go away. Good luck! Matt and Brooke,I used Enfamil formula. I have a friend who formula feeds who uses Similac. Those are the two brands they give in the hospitals around here. I don’t know that it really matters much, though :)I would definitely give it to her in the Sippy. Thanks for your advice Jennifer! Ashley, you need to replace it with something. My pedi says no milk before 12 months, so what I did was replace with formula if it was before 12 months. But I waited until 12 months if I could so I could replace with milk rather than formula. Hi. My daughter is almost 9 months old now and until the past few weeks, has always taken a bottle great. She had her first bottle at only a few days old and we've never had a problem until now. A couple of weeks ago I started weaning her off nursing. I dropped one feeding and then about a week later, another…and so on. I have substituted with formula and she drinks anywhere from 0.5 ounces to 3.5 ounces. Is this okay? Isn't she supposed to be drinking 8 ounces at each feeding prior to eating solids? She seems to eat a lot so does that make up for the calories she is missing from formula? I have wasted so much formula because I never know how much she will drink. I try to give her formula 3 times a day and the amount she drinks varies (.5 to 3.5 ounces) and it seems like even 3.5 ounces is way too little. Should I just stop giving her bottles and more food? I really need some advice. 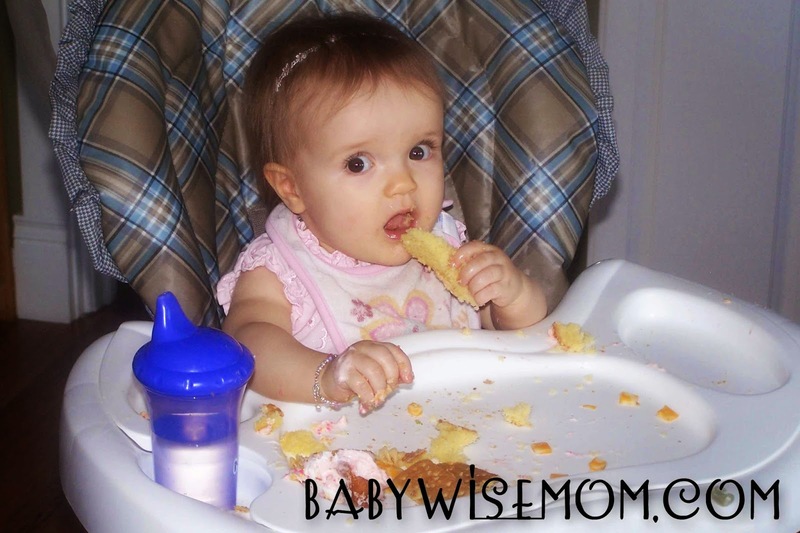 Tanya,I think if she is eating solids, she should drink about 24 ounces a day…I am not positive though. It might be more. I nurse so I don't know how many ounces are common at that age.I would try to give it to her in four feedings instead of three. So do 6 ounces every four hours. Also, I would just prepare 4 ounces, then make more if she drinks all of that and wants more. They do sell 2 ounce packets I think. I have a question about when I wean my son. He is 10 1/2 months right now and I will start weaning as soon as he turns 1 because I don't want to deal with formula. You mentioned that with your daughter it was hard to get her to drink much milk at first and I feel that I might have the same problem. My son doesn't take a bottle (he started refusing them a few months ago) and he drinks from a Sippy, but with my help right now because he is still trying to figure them out 🙂 My fear is that when I start dropping feedings, he won't get enough fluids. How can you guarantee that they will get enough fluids if they don't take bottles and are still learning the Sippy? For example, I feel that he would be confused if we're sitting in a chair trying to drink milk from a Sippy before bed. This might sound silly but I am stressing! Ha. Thanks!! Have him drink water from a sippy throughout the day now. Your main concern will be liquid–like water. You can easily get calories through other forms of dairy. Do the practice now, keep it low-stress, so you can not worry when the time comes. I am having him do that, so it sounds like I'm on the right track 🙂 Thanks!